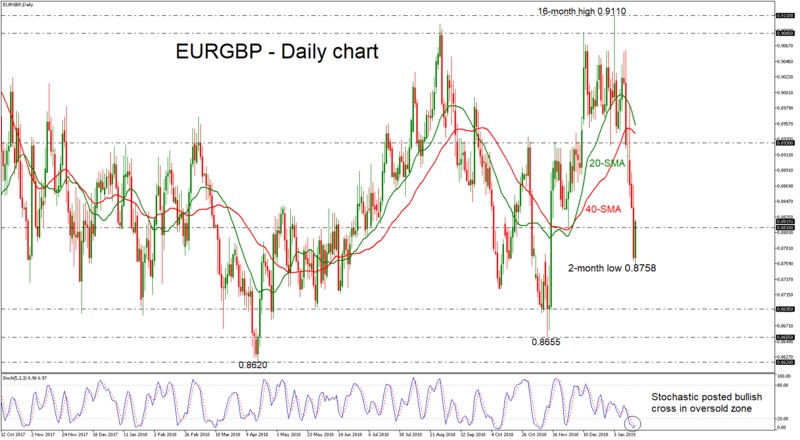 EURGBP has been erasing the strong bearish rally that was created the previous six consecutive days, sending prices towards a new two-month trough of 0.8758. The stochastic oscillator is suggesting a positive retracement as the %K line jumped above the %D line creating a bullish crossover in the daily timeframe. An upside rally in the pair and a successful close above the 0.8810 barrier may retest the 0.8930 resistance barrier. Even higher, the price could test the 40- and then the 20-simple moving averages (SMAs) around 0.8940 and 0.8955 respectively. Alternatively, a decline again in the price may retest the 0.8695 support level, taken from the low on May 29. More downside pressure could send the market until the 0.8655 region, identified by the bottom on November 13. Concluding, in the bigger view, EURGBP has been trading in a consolidation area over the last 16 months.